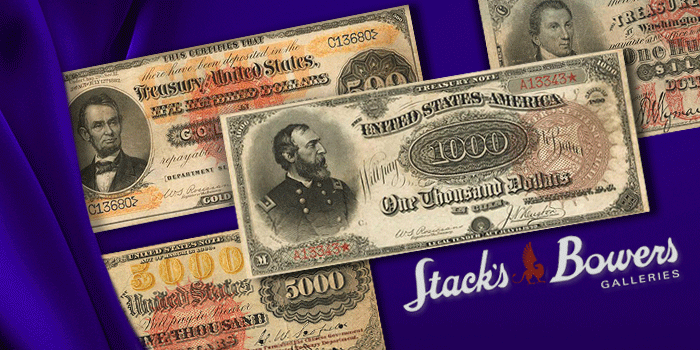 By Charles Morgan for CoinWeek …..
At 6:00 PM EDT on October 25, Stack’s Bowers will kick off the third session of their historic offering of the Joel Anderson Collection of Paper Money. Anderson is a major figure in the American publishing industry, whose business portfolio includes Books-A-Million, Whitman Publishing, and the Anderson Press. He is also the owner of the largest retail fireworks company in the United States. 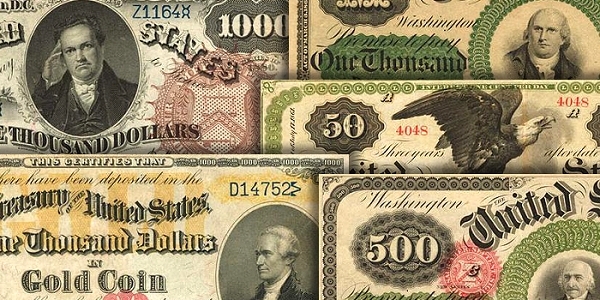 Anderson’s paper money collection is one for the ages, with an estimated value approaching $30 million. From the Anderson Collection: A collage of some of the most important paper money issues in the U.S. series. In the first two sessions of the sale, The Anderson Collection has already realized $20,206,234. 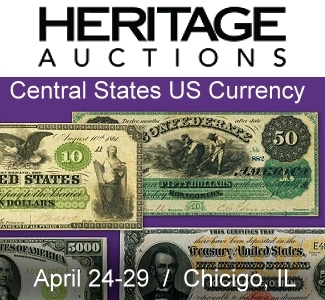 Highlight notes from the collection that have sold over the course of these two sessions include Anderson’s 1861 $50 Interest Bearing Note and 1880 $1,000 “Black Back” Silver Certificate of Deposit, both of which brought $1,020,000; his 1863 and 1880 $1,000 Legal Tender Notes sold for $960,000 apiece; and an 1863 $500 Legal Tender Note, which brought spirited bidding, selling for $900,000. In this, the third session, Stack’s Bowers will offer 54 exciting and important lots. We will discuss four important notes in this edition of Lots You Need to Know. 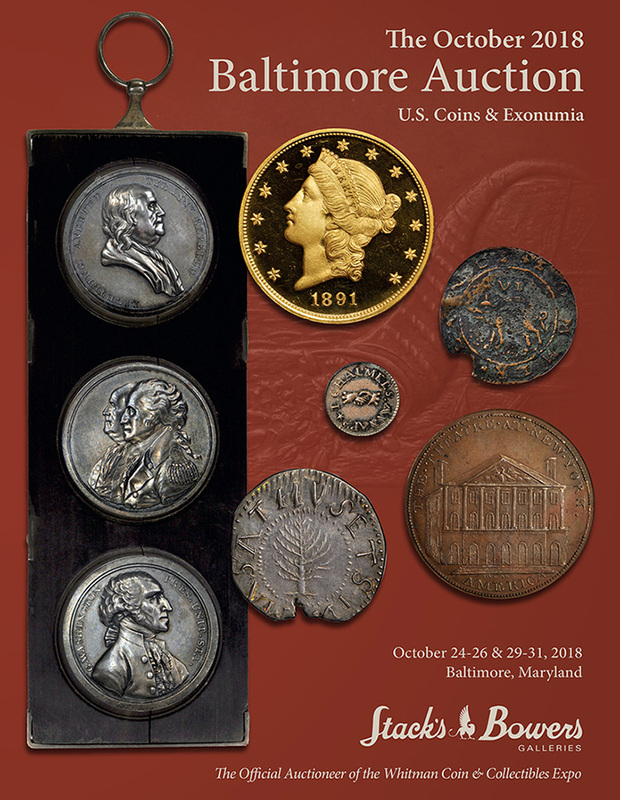 Beyond this exclusive sale, Stack’s Bowers will also offer a full complement of auctions covering all aspects of American numismatics. 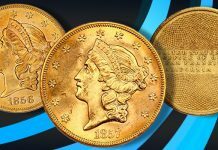 To read CoinWeek’s coverage of our favorite modern and classic coins, click on the links below. Also, check back on October 11, as we highlight important pieces in the Caine, Herzog, and Archangel Collections. 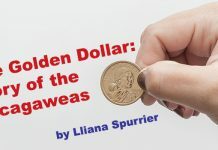 With this housekeeping out of the way, let’s break down five of the important paper money lots from Stack’s Bowers third session of the Joel R. Anderson Collection that you need to know about. Lot 3015: Friedberg 188 (W-4970). 1878 $5,000 Legal Tender Note. PCGS Currency Very Fine 25. Specimen. Lot 3015 is a unique 1878 $5,000 Legal Tender Specimen Note. 4,000 pieces of this catalog number were printed and no issued pieces survive. This example is printed on BEP banknote paper and appears exactly as an issued note would have, save for the absence of serial numbers. In their place are three blue stars. The note’s front features a likeness of James Madison and the back features one of the most elegant engravings of an American bald eagle ever published by the Bureau of Engraving and Printing. It’s ironic that so many of America’s founding fathers found their way onto our paper money seeing as they absolutely loathed the concept of it. Lincoln, who graces the $5 is more fitting for the honor as his administration famously issued the first greenbacks. According to Stack’s Bowers, this unique specimen was provided to the Chinese government by the U.S. Treasury Department. At the time, and still true to the present day, governments provide countries they do business with specimen examples of their currency so as to facilitate trade and exchange. No other examples of this type have turned up and its likely none ever will. A decade ago, this piece brought over $800,000 at auction. Stack’s Bowers estimates the sale price of this note to be between $600,000 and $800,000, but given its rarity and import, the note could exceed these numbers. Lot 3042: Friedberg 379a (W-4580). 1890 $1000 Treasury Note. 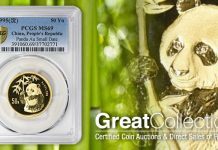 PCGS Currency About New 50. It is the plate note of Bowers and Sundman’s 100 Greatest American Currency Notes, a book, that might as well be a love letter to the Anderson Collection as quite a few specimens lovingly listed and described make up the 240 piece grand set. On the front is a portrait of Union Major General George Meade. Meade’s entire adult life was dedicated to the defense of, preservation of, and restoration of his country. A soldier until his last day on November 6, 1872, he was in command of the Army of the Potomac for less than a week before he found himself pitted against Robert E. Lee at Gettysburg, in what turned out to be the decisive battle of the American Civil War. After the war, he served as the governor of the Third Military District, overseeing the reconstruction of Georgia, Florida, and Alabama. This 1890 issue gets its nickname, not from Meade, however, but from the note’s beautiful green-colored back, which features a large-sized 1000 in the center with each of the zeros depicted as ovaloid shapes with watermelon-like stripes. It was a nickname that was earned upon release and has stayed with the note and its smaller sister note, the $100 “Watermelon”. Stack’s Bowers traces the provenance of this note to numerous important collections, including those built by F.C.C. Boyd, Robert Friedberg, and Amon Carter, Jr. This is the first currency note to eclipse the $1 million mark at auction, selling for $1,092,500 at an October 2005 Lyn Knight sale. Stack’s Bowers estimates the sale price of this note to be between $1.25 million and $1.75 million. Lot 2022: Friedberg 1215d (W-4206). 1882 $500 Gold Certificate. PCGS Currency Very Fine 35. Before the present example turned up as a consignment from a small town collector in the Spring of 2013, the only known example of this extremely important National Bank Note, issued in 1882 and signed by Rosecrans and Hyatt, was impounded in the collection of the Federal Reserve. 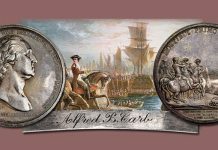 Uncollectible and seldom seen objects are typically difficult to gauge in the marketplace, but collector Joel Anderson spared no time or expense when stepped up to the plate and purchased the note at its auction debut. The final price with buyer’s premium was $1.41 million. The note’s design is distinctive and ornate. On the obverse, on the left side, is a portrait of Abraham Lincoln. Above this vignette is a reference to the Act of July 12, 1882, a major piece of banking legislation that modernized the national banking system and called for a complete redesign of American currency notes. On the right side of the note, the denomination is written in large numerals and is printed over a circular spirograph pattern. The note states that “Five Hundred Dollars in Gold Coin” has been deposited in the Treasury of the United States and is “repayable to the bearer in demand.” A large ornate spiked seal is printed in red underneath, overlaid by the word GOLD, written in large Gold letters. The back of the note features a flying eagle vignette with a red spiked D on the left side. In a collection filled with highlights, in which many notes are the only ones of their types, or the finest ever seen, it is easy to overlook the importance of individual pieces, even ones that are expected to bring between $1 million and $1.5 million. Lot 3035: Friedberg 337b (W-3616). 1878 $100 Silver Certificate of Deposit. 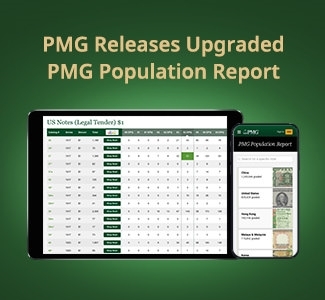 PCGS Currency Very Fine 25. In a sale chock full of major rarities, notes with iconic designs, and specimens in exquisite condition, it’s easy to overlook pieces that were it not for the sheer good fortune of their survival that whole chapters of our country’s financial story might be lost to history. The present note is astonishingly rare, though not unique. 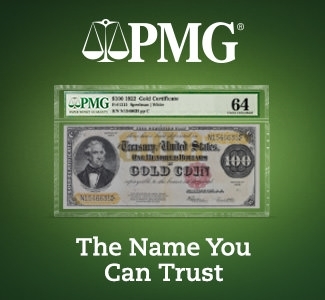 It is one of two 1878 $100 silver certificates in private hands that feature a triple signature on the front. President James Monroe features on the note’s front. He is offset to the left side, while a red Treasury seal surmounts an ornately detailed “100”. A collage of vegetal relief, a scalloped spirograph feature, the note’s serial number, and denomination fill the right side. The reverse features an intricate typeset with still more ornamental detail filling the words “UNITED STATES”, “SILVER”, and “CERTIFICATE.” The note is printed on blue-tinted paper. The three signatures on the note are those of Assistant Treasurer A.U. Wyman, Treasurer James Gilfillan, and Register Glenni William Scofield. Of the three, only Wyman’s was rendered by hand. The others were added by plate. It’s astonishing that more than a decade into the issuance of paper money, that the Treasury Department was still toying with the idea of hand-signed notes. With just two of the type in private hands, it goes without saying that opportunities to acquire one are few and far between. According to Stack’s Bowers, its been decades since the last one came to market. The last one selling for $59,000 in 1989- lifetimes ago when it comes to the collecting market. 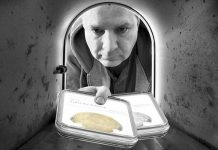 If Stack’s Bowers presale estimates are on point, this time around the winning bid will be somewhere between $500,000 and $700,000. Session 1 – U.S. Coins Part 1. Exonumia and Half Cents through Half Dollars. The live auction session begins at 4 PM EST on Wednesday, October 24 in Room 308. Session 2 – U.S. Coins Part 2. Silver Dollars through the End. The live auction session begins at 10 AM EST on Thursday, October 25 in Room 308. Session 3 – Rarities Night. The live auction session begins at 6:30 PM EDT on Thursday, October 25 in Room 308. Session 4 – The Joel R. Anderson Collection United States Paper Money Part III. The live auction session begins at 6:00 PM EST on Thursday, October 25 in Room 309. Session 5 – The Caine Collection of Federal Essays and Proofs Part I. The live auction session begins at immediately following the conclusion of Session 4 on Thursday, October 25 in Room 309. Session 6 – The John E. Herzog Collection of United States Paper Money Part II. The live auction session begins immediately following the conclusion of Session 5 on Thursday, October 25 in Room 309. 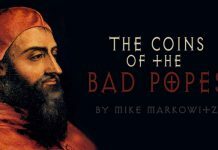 Session 7 – Early American Coins. The live auction session begins at 11:00 AM EST on Friday, October 26 in Room 308. 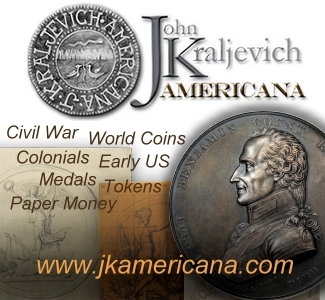 Session 8 – The Archangel Collection of Colonial Coins and 1792 Coinage. The live auction session begins at 6:30 PM EST on Friday, October 26 in Room 308. Session 9 – U.S. Currency. The live auction session begins at 5:00 PM EST on Friday, October 26 in Room 309. Session 10 – Internet Only – U.S. Currency. The live auction session begins at 9:00 AM PST on Monday, October 29. Session 11 – Internet Only – U.S. Coins Part 1. The live auction session begins at 9:00 AM PST on Monday, October 29. Session 12 – Internet Only – U.S. Coins Part 2. The live auction session begins at 9:00 AM PST on Tuesday, October 30. Session 13 – Internet Only – U.S. Coins Part 3. The live auction session begins at 9:00 AM PST on Wednesday, October 31.